The Registrar General's Department (RGD) offers private weddings at an affordable cost; you have a choice of venue: an indoor decorated office at all RGD locations or an outdoor secluded garden at our Head Office. 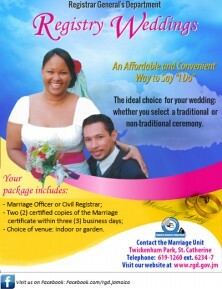 All ceremonies are performed by a Civil Registrar or Marriage Officer. RGD is ideally suited for wedding ceremonies as the Agency trains and supervises Marriage Officers and also issues certificates of Marriage Registers. or simply change the spelling of one’s name. A Deed Poll works in the same way as a marriage certificate for a married woman who wishes to take her husband's surname. She writes to everyone that has her name on records, enclosing her marriage certificate as documentary evidence, and requests that her surname is changed to her husband's. After changing your name by Deed Poll, you simply write to everyone, enclosing your Deed Poll as documentary evidence, and request that your name be changed to the new name shown on it. The letter then goes to the Stamp Office. The entire process is carried out by the officer; drafting, sending draft to stamp office and forwarding to IRO for recording and dispatch. A letter addressed to The Chief Executive Officer, Registrar General’s Department (RGD), Twickenham Park, Spanish Town, St. Catherine, requesting a DEED POLL. The letter should clearly state the name change required. An authorization letter is needed, which is to be signed by Notary/Consul/Vice Consul/ Jamaica High Commissioner.